LIDICE. A small village located only a few miles north-west of Prague. 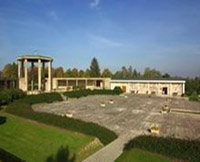 It is built on the site of a previous village of the same name which was ordered directly by Heinrich Himmler to be completely destroyed by German forces in reprisal for the assassination of Reinhardt Heydrich. This much documented atrocity perpetrated by the Germans goes down in history as one of the very worst.. The entire population were sent to Nazi concentration camps where many of the women and nearly all the children were killed. 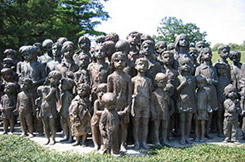 The sculpture depicted above were created during the 1990s by academic sculptor Marie Uchytilová poignantly reflects the children’s faces and overlooks the site of the old village of Lidice. “The Memorial to the Children Victims of the War” comprises 82 bronze statues of children (42 girls and 40 boys) aged 1 to 16 to honour the children who were murdered at Chelmno in summer 1942. There is a small cinema where we can watch a thought provoking film which features not only Lidice but many other aspects leading up to the second world war. We can also visit a permanent photographic exhibition. Although the town and its inhabitants were destroyed (Himmler ordered that the town be eradicated from the map), the town rose again from extinction at the end of WW11. However as a mark of respect the new Lidice was built on adjoining land. The original site remains to this day an untouched monument. A most humbling and though provoking experience and one to not to be missed. The village sits very close to Prague and around 5 minutes from Prague airport. Interestingly the Lidice story in Western Europe was little known in the cold war era and rarely visited by people living outside the eastern bloc.